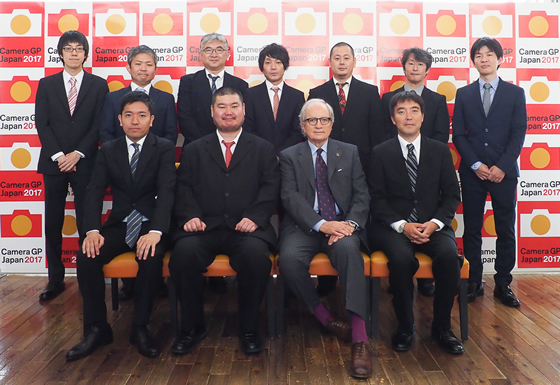 The winners of the Camera Grand Prix 2017, hosted by the Camera Journal Press Club of Japan (CJPC), received their awards in Tokyo on 1 June, 2017. The Camera Grand Prix, held since 1984, is a prestigious award whose winners are selected by a judging committee made up of the members of the CJPC, top editorial staff of the member publications, academic experts, technical writers, professional photographers and TIPA. The awards ceremony is held annually under the sponsorship of the CJPC, which was founded in Japan in 1963. The CJPC has a collaborative agreement with TIPA (Technical Image Press Association) whereby they vote on each other’s awards. TIPA’s selection for winners of the Camera Grand Prix awards was decided upon at the association’s General Assembly meeting held in Havana, Cuba in March 2017, with a representative of CJPC in attendance. Giulio Forti, Vice-Chairman of TIPA, attended the CJPC awards ceremony in Tokyo. There were four award categories in the Camera Grand Prix 2017. The ‘Camera of the Year’ and ‘Lens of the Year’ awards were selected by a total of 49 individuals who voted for the best products introduced to the Japanese market. The ‘Editors Award’ winners were selected by CJPC members from among cameras and photography related products and equipment introduced in the Japanese market during the past year. In addition, the ‘Readers Award’ is selected by magazine readers. Three years have passed since OLYMPUS OM-D E-M1, a Camera Grand Prix 2014 Editors Award winner, was first launched in 2013. This new flagship model, the OM-D E-M1 Mark II, marks another development and further expands the concept of the mirrorless camera. Its sequential shooting performance exceeds that of single-lens reflex cameras, with the maximum fps at 18 in continuous AF/AE tracking mode and 60 fps in single AF/AE using the silent sequential shooting mode. Its autofocus performance readily captures even fast-moving subjects. The amazing 5-axis in-body image stabilization system provides up to 6.5 shutter speed steps when paired with a compatible lens. The image quality, portability, overall handling and dust- and splash-proof body all appeal to professionals and amateurs alike. Although classified as a high magnification zoom lens, its performance goes beyond what is expected for the class. It provides a constant f/4 aperture throughout the focal length range and provides superior resolution with enhanced aberration suppression throughout that range, defying expectations of what a zoom lens is capable of delivering. When combined with OM-D E-M1 Mark II, the image stabilization goes up to a surprising 6.5 shutter speed steps advantage (based on CIPA standards), which enables handheld shooting for 1 second or longer. Nikon’s long-awaited flagship in its APS-C digital single-lens reflex category uses the same autofocus sensor module as that on D5, Nikon’s full-frame DSLR flagship. The D500 is moderately priced, making it accessible to non-professional users: this cost/performance ratio was a key element in our award decision as we felt that the rugged body, quality viewfinder, and the powerful continuous shooting capability make the camera worthy of being considered as a “high-end” model. Plus, the D500 enhances the appeal of APS-C DSLR cameras in general. Its AF covers a wide portion of the image area with high accuracy, especially when photographers use it to acquire moving subjects. In a time when mirrorless cameras often draw more attention, the D500 demonstrates once again the attractiveness of the DSLR format. The success of this model has contributed to a wider recognition of medium-format mirrorless cameras as a new and exciting category. Its image sensor is approximately 1.66 times larger than a “full frame” format, yet the body is compact and lightweight, taking full advantage of the mirrorless structure. We consider this product an extension of Fujifilm’s rich tradition and history, one that marries its past accomplishments producing medium-format film cameras with the latest technology. We highly appreciated not only the outstanding resolution but also the high degree of perfection, achieved through the company’s long experience in developing its X-series APS-C mirrorless cameras. This is a notable camera that is the first in what we anticipate will grow into a new product line that will excite and appeal to enthusiasts and professional photographers alike. The Readers Award was established in 2008 to commemorate the 25th anniversary of Camera Grand Prix. The award is determined by general users voting on a dedicated website. The voting period in 2017 was from 18 March to 9 April. The Camera Grand Prix is held by Camera Journal Press Club (CJPC, Japan), a group of representatives from magazines or websites specializing in photos and cameras. CJPC, established in September 1963, has 10 members from the media as of April 2017. The selection committee, organised under the auspices of CJPC’s Camera Grand Prix Executive Committee, deliberates and selects the best products for the four awards from among those introduced into the market during the previous fiscal year (from 1 April to 31 March). The Camera Grand Prix “Camera of the Year” is granted to a still camera recognised as the best of all released during the period. “Lens of the Year” is awarded to the best lens launched in the Japanese market, while the “Readers Award” is determined by a general camera users’ vote on a dedicated website. In addition, CJPC members give an “Editors Award” to a camera or another form of photography-related product, excluding the one awarded “Camera of the Year”, in consideration of the product’s popularity, topicality and innovations.